Limca Book of Records recognized my achievement. I am the youngest, in India, to have four post graduate degrees. 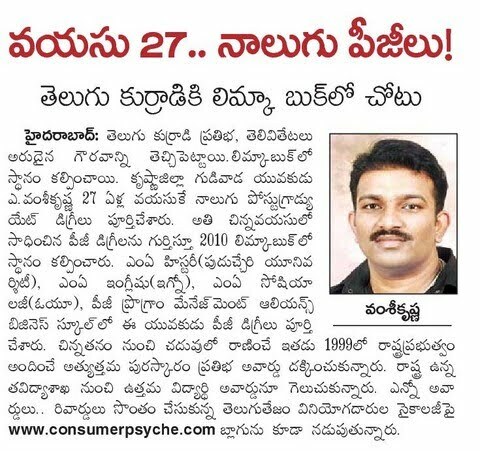 I completed four PG degrees by the age of 27 while the previous record was held by Deepak Bansal at 29 years. Am humbled by the response. Let me start by thanking God Almighty for his blessing. My Mom and Dad deserve a special mention at this juncture for their love, perseverance and motivation all through... Thanks for driving the importance of being well read and humble. But for you.. this means nothing. My friends who are J and making others J, thank you. For all the wonderful institutes, luminous faculty, authors, books and so on.. thank you. As I said, am humbled. Not so philosophical though, I just read for fun. 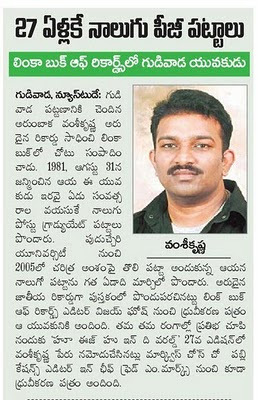 My hearty congratulations to Vamshi. 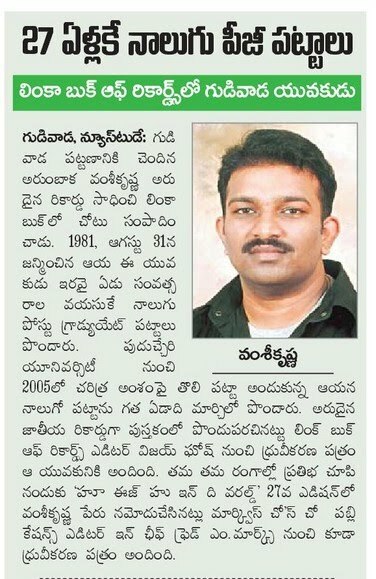 I am happy that Vamshi Krishna was my pet student at Alliance during 2007-09 and authored three research / conference papers jointly. He is hard working, intelligent and sincere student. I wish him all success in his career and life too. P.S. When and how do you find time for anything else??? You should pen a book on "time management"... it will be a best seller... for sure! Congratulations dear.. None wrote abt the Phd that u r pursuing? 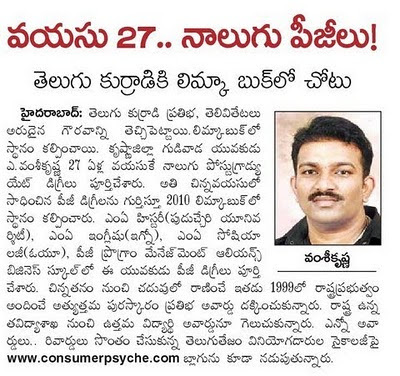 congrats vamshi !! needs real dedication and hardwork for achieveing it... you deserve it..